I've been wanting to try E-San Thai on south Commercial for awhile now. I remember going to an E-San Thai in downtown Portland years ago. I thought it was good, but that was before I really knew what I liked in a good Thai dish, so I was excited to try it again. After a long Monday at work, I decided that I would stop for dinner instead of heading home and cooking (good idea, right??) so I headed in by myself and was promptly seated at a table by the window. 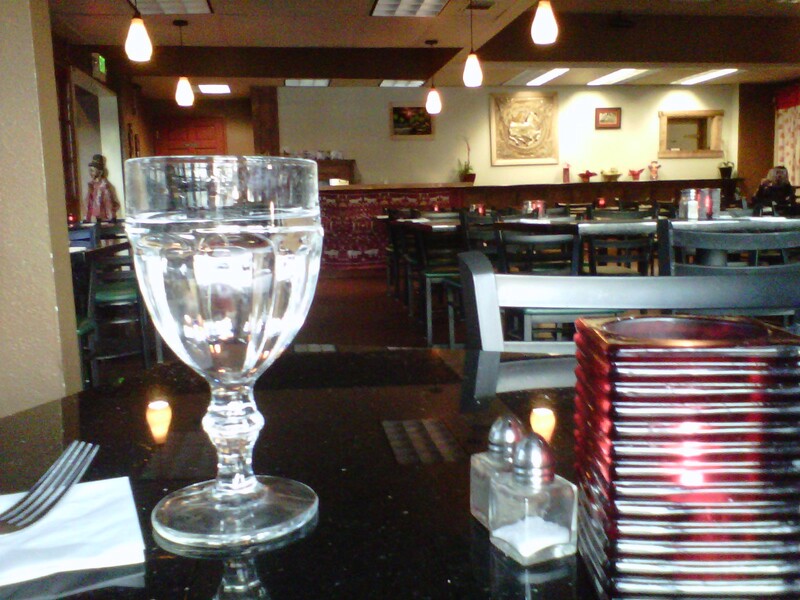 The server/hostess was very friendly and brought me out a glass of water almost as soon as I sat down. I suppose it helped that I was the only one in the restaurant other than a young boy and a toddler who appeared to be her children. They ran around a bit, but otherwise didn't bother me. This is clearly a family run operation, but by the time I was finishing my dinner and other dinner guests were arriving the extra family had cleared out and everything was pretty professional. E-San Thai Cuisine went in at the old Bigfoot Bar location just north of Fred Meyer. Oddly enough they still have the giant, oversized log furniture in the lounge/bar side of the restaurant. If someone didn't know the history of the place it would be quite a mystery as to why the bar was decorated in such a fashion! The dining room side is pleasantly decorated with black furnishings, red and gold accents and candles on the tables. I perused the menu, but I was mainly trying to see if they had Pad Kee Mao, which is my current dish of choice. I asked the server about the Pad Kee Mao, (also called Drunken Noodles sometimes) and she said it was the best noodle dish they had. 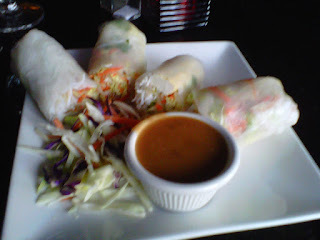 I ordered some Fresh Garden Rolls ($3.75) to start, which are rice paper stuffed with noodles, lettuce, herbs, and tofu and then dipped in peanut sauce. And then of course I had to try the Pad Kee Mao with chicken ($10.95). Maybe I was just hungry, but I'm pretty sure the Rolls dipped in peanut sauce were fit for the gods! It was actually the peanut sauce at E-San that made these rolls so amazing, I believe. Anyway, they were very tasty, so I ended up eating them all myself and not leaving much room for my main dish. My entree came out just as I was finishing my rolls, but I wasn't so full that I didn't have room for a few bites! Okay, maybe quite a few. I had asked for a medium spice and it was quite spicy. Drunken Noodles are supposed to be spicy apparently, and these definitely lived up to that reputation. Fortunately, I like a little spice in my life! If you are at all sensitive to spicy things, you might want to go with mild at E-San. 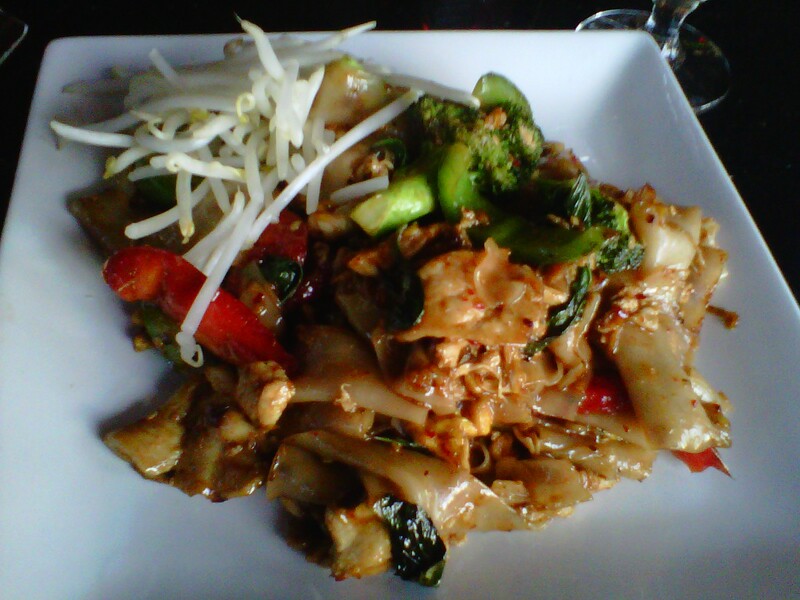 I do believe that the Pad Kee Mao at E-San Thai was the best I've had in Salem, and believe me, lately I've been trying them out religiously all over town. The wide noodles were nice and thick, the vegetables were flavorful, and the sauce was spicy and delicious. I really liked this dish and will definitely be back to try it again. That is my favorite dish there as well- though we usually get it with beef. Every single thing we have tried at E San has been phenomenal! My husband works near the one in downtown Portland so we have been enjoying their food since before they had a restaurant here. We were so glad when this one opened! Next time, try the lettuce wraps- they are delicious! Nice review Rebekah. Thanks. I think E-San probably has the best Thai food in Salem (Thai Beer has slipped a bit). My favorite here is the house-made Thai sausage. It's delish! It's so great to see a Portland restaurant open a branch in Salem. So let's patronize it everyone so they make it here. OK? Remember Buster's? Don't let that happen to E-San. Next I will take a branch of the Nicholas Lebanese restaurant here, and a branch of Ocean City or Shen Zhen please. I agree, this is a great review. I have been meaning to go, but keep forgetting to. I love the Portland one and I've always had great food there. Thai Beer used to be my favorite, but the last two times I went, the food was awful. Maybe they got a different chef. Hey Jia, KYKN Radio has $10 E-San gift certificates for $5! I agree that both Thai Beers are way off the mark. Housekeeping is sorely lacking at both locations and service at the Lancaster location is, to be kind, indifferent. There are too many great Thai places in S/K to waste my money there. Red Ginger and Thai Lotus are my favorites. Tup Tim is good too. Thanks Chuck! I'm checking it out now. That website looks awesome! We've been twice recently and LOVED it!! The food is divine, the service wonderful, and the owner and his family are sweet & nice! We recommend this restaurant highly. Go and ENJOY!!! Tell your friends so we can keep them around a long time!! Interesting that you both mentioned Thai Beer having gone downhill lately as that has been my experience too! I used to love it, but lately...just a little bleh. Glad to have another Thai option in town. I ordered the Pad Kee Mao with tofu/mild yesterday for lunch. There was not one sprig of broccoli,about 4 of each red and green peppers, and only 2 basil leaves. It tasted ok, I missed the broccoli. I will try it again, ask for extra veggies and medium heat. I went back the other day and asked for mild since it was so hot last time. Yeah, bad idea. That apparently means NO spice. Next time I'll try for a medium again and ask them to go easy on it. Also, fyi, in noodle dishes I don't love a lot of crisp veggies as I prefer to savor the soft noodle texture, so I actually like the fact it doesn't have so many veggies. Visited a few days ago for lunch; pretty empty except for another couple. First thing we noticed was our table was wobbly, not horribly, but wobbled enough that it was irritating while we ate. It was a beautiful day which gave way to the grimy windows beside us .. ok looked past that. Ordered our food, Pad Phet and Evil Prince (two of our favorites) medium hot (we enjoy spicy food). Our not-very-outgoing waitress (only one there) didn't even ask if we wanted drinks; just brought water and scooted away. Then the uncomfortable wait at our wobbly table ... no soup ... what?!? A little cup of soup is such an inviting way to start any Thai meal and can't cost much for them to make; especially when they are charging more than most Thai restaurants @ $8.50 per lunch. Here comes the food .. yes it was delicious! Vegetables nice and crisp; great flavoring/spice; chicken was a little sparse. I'd give this place 3 out of 5 stars. If the owners are reading .. clean your windows, fix the wobbly table(s), offer a cup of soup with your meals and don't raise your prices. Oh .. and offer your customers a drink besides water. We went here late Saturday night. There was one table occupied and we were offered a seat right next to them. We said no, could we sit somewhere else. None of the tables were bussed/clean, still had dirty dishes. The lady sprayed smelly cleaner all over the table and we sat down. It took a while for the woman to come back to take our order. Although the restaurant was empty, we waited what felt like forever for the appetizer to come out. A deep-fried veggie spring roll. Minuscule portion size. Wouldn't order that again. We ordered Phad Thai, mild. When it came, it was very good, though spicy, but good. Again, the portion for what you pay could be better. Another loud group came in and was seated right next to us (what's with that? you have an empty restaurant, spread it out!). Not sure if we'll be back. The main dish was good, but the service/wait time was so poor. I absolutely love the food there, but I agree that the service could really use some work. I find the portion sizes to be pretty decent (at least two meals worth of food), but I've learned that getting takeout is the best way to go. They made my order wrong the two times I've been there, but it was still tasty. The waitstaff really needs some help.